The normal lilac-flowered Crocus banaticus bloomed here several weeks ago, starting in late September, but this clone is just at its peak now. It has been rather glomy today, so I picked a flower and brought it inside to open in the warmth - which enables me to enjoy it on my desk. 'Snowdrift' is the best white C. banaticus I have come across - a really gorgeous, large flower, 7 cm from segment-tip to segment-tip, and the frothy white stigma in the centre is exquisite. Like any C. banaticus it is easy in the open garden here - if the mice leave it alone. They seem particularly fond of this species and I dread finding the clump ransacked by a rodent. The mid-part of the day was spent at the Nerine and Amaryllid Society meeting, where the highlight was a talk by Sue Bedwell on bulbous and other summer-flowering plants of the Eastern Cape. I had to slip away mid-afternoon, however, to attend a symposium to launch the Calleva Research Centre for Evolution and Human Science at Magdalen College. This included an extremely interesting talk by Matt Ridley on the evolution of human innovation and prosperity, and three short lectures on psychological aspects of human development - not a subject I usually grapple with. ﻿ Set in the flagstones of St John's Quad outside the chapel at Magdalen is a discrete gravestone (above). The initials are for Charles Giles Bridle Daubeny (1795-1867). Born just down the Churn Valley from here, at Stratton near Cirencester, he became one of Oxford's earliest all-round scientists, successively and consecutively Professor of Chemistry, Botany and Rural Economics. Highly respected in his lifetime, he was an early follower of Darwin, and is currently honoured in Oxford by the Daubeny Building (adjacent to the Botanic Garden) and the Daubeny Herbarium in the Department of Plant Sciences. ﻿﻿Botanists and gardeners interested in South African plants know his name in the genus Daubenya (Hyacinthaceae), comprising eight low-growing bulbous plants. The first to be named was Daubenya aurea, named in Daubeny's honour in 18235 by John Lindley. It is remarkable for its extraordinarily enlarged lower perianth segments, which flare out into a rather crown-like ring around the cluster of flowers at the centre of the plant. 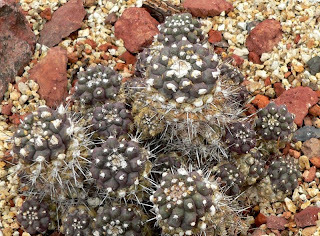 It comes from the rather arid and cold area known as the Roggeveld in the Karoo, and is a prized specimen for the enthusiast: this potful is cultivated by Graham Duncan in the bulb greenhouse 'behind the scenes' at Kirstenbosch. In recent years several species, formerly in other genera, have been added to Daubenya, but D. aurea is far and away the most spectacular (see the Pacific Bulb Society wiki page on the genus for more information). One has to hope that the Professor saw the plant that bears his name, but Lindley named it from cultivated material, so he possibly did. Another Oxford connection with the monocot flora of South Africa comes in the genus Bobartia, which Linnaeus established to commmorate the two Jacob Bobarts, father and son, who were the first two superintendents of the University Botanic Garden, Bobart the Elder being appointed in 1632. A member of the Iris family, Bobartia is rather obscure, and although a species used to be cultivated in the Botanic Garden glasshouse I had never seen flowers until our recent visit to South Africa, when we found one in flower on the Groenlandberg - on a very windy day. It is possibly B. gladiata. I paid a long overdue visit to Nick Macer at Pan-Global Plants, Frampton-on-Severn, this afternoon and enjoyed a good long chatter about plants, especially the good ones with which his nursery is so abundantly stocked. Here are a few leaves that caught my attention. Rhus succedanea, from seed collected by Nick Macer in Vietnam. Although it is now past its peak the colour in the leaves is amazing. ﻿﻿﻿Given the wonderful range of colours found in the Nerine sarniensis hybrids and the limited palette of pinks and a few whites in N. bowdenii, it is not surprising that breeders have long wished to see a combination of 'colour' and hardiness. As the two species, despite their very different annual cycles, flower at about the same time it is quite easy to dab pollen between them, and occasionally a hybrid seed is set. This process is not quite as easy as it may seem, as the two are not very compatible, and there are often differences in chromosome number between clones that prevent fertilization occurring. The most successful breeder of hardy hybrids to date has been the late Terry Jones, who conducted a decades-long breeding programme at his home in Zeal Monachorum in Devon. His best known selection is the enormous 'Zeal Giant' (right), now quite freely available. It produces large, bright reddish pink flowers on robust stems at least 60 cm tall and is a really impressive plant in full flower. It is hardy in mild gardens in southern England, but was killed here in an ordinary winter. Two other selections distributed by Terry Jones are relatively well-known, 'Zeal Salmon' and 'Zeal Grilse'. They certainly add a new set of colours to the palette, with the salmon shades being especially distinct. Nerine 'Zeal Purple Stripe' - a reference to the stripe that develops down the centre of each 'petal' as the flower matures. ﻿Others have also tried their hand at breeding hybrids, but have not always selected for hardiness. 'Afterglow', illustrated below, is also Nerine sarniensis x bowdenii and has inherited the true N. sarniensis colour that is so sought after, to make a true break from pink. It is winter-growing, however, and is therefore not hardy. Other combinations of parents have given offspring, notably N. bowdenii x N. undulata ("flexuosa" forms), but these tend to be very late flowering and of limited garden value, and there are bigeneric hybrids with Amaryllis belladonna, known as the hybrid genus xAmarine. For those interested in the genus Nerine and its relatives, The Nerine and Amaryllid Society is a small but dynamic society, with a journal produced three times per year, a bulb exchange, and visits to gardens and nurseries during the flowering season. The AGM, get-together, and series of talks will be held tomorrow at Holton Village Hall, near Oxford. The society's website provides more information, but not everything: prospective members should contact the Secretary for information on subscription rates. For most British gardeners, at least, Nerine bowdenii is the most familiar species in the genus; it can be seen in gardens throughout the country, often in large pink masses. It is totally hardy in this climate, but the myth persists that it needs to be planted against a warm wall. This is quite definitely not the case, as it has been shown that flowering is reduced if the bulb gets too hot, and as a summer-growing plant it needs ample moisture during the growing season, not often found at the base of a warm wall in summer. It thrives best in ordinary garden conditions with well-drained soil and full sun, preferably without much else growing around it. Nerine bowdenii is found in two apparently disjunct populations in the wild. It was originally discovered in the vicinity of King William's Town , Eastern Cape, and plants from this population are still the most abundant in cultivation. They are typically rather bright pink, and the perianth segments (petals) are usually more or less smooth-edged, or slightly wavy. The cultivar 'Linda Vista' (right) is typical of this population. A few hundred kilometres away the species reappears, on the cliffs of the Drakensberg where Kwa-Zulu Natal meets the Free State at Mont aux Sources. Here the flowering stems are perhaps a little taller, the flowers often a pale pink and the segments have strongly waved or crisped edges. This population is known by the invalid name var. wellsii and look rather different from the Eastern Cape plants: I believe they certainly deserve taxonomic distinction, probably as a subspecies. Unfortunately I don't have a digital picture of this at present. Both locations are in the summer rainfall area, and experience cool or cold dry winters. The plants are deciduous, losing their leaves in winter, and it is this critical fact that makes it hardy in Britain - they are effectively dormant through the worst weather. Even though the bulbs usually protrude from the ground they are seldom if ever damaged by frost. The plants leaf out in spring and grow through the summer, and have often withered before the inflorescences emerge, though if the soil remains moist the foliage may still be active at flowering time. I find the ordinary bright pink of N. bowdenii a rather difficult colour to place in the garden, and think it's best grown away from most other plants blooming in September and October, but it looks good among grasses, and the subtle greyish greens often found in 'mediterranean' plants. As with any popular garden plant there are numerous cultivars selected for colour, floriferousness, height, etc, and there is even one with marginally variegated leaves, 'Mollie Cowie'. Many are rather indistinct and the names are often muddled in commerce, but some are well worth having. I prefer the paler shades of pink, such as those seen here: 'Marnie Rogerson' (left) and 'Pink Surprise' below. This is a poor example of 'Pink Surprise', with far fewer flowers than usual: I think it is one of the very best cultivars. A clone that opens very pale pink and fades to almost white has been known for many years as 'Alba', but it is not really very special in either colour or vigour. In recent years some much better white-flowered clones have appeared, including 'White Magic' (below), which is pure white with a green keel on the outer surface of the perianth segments, a sure sign of it being a true albino. A clump of this doing well will be a magnificent sight, but as I have only one bulb at present there is some way to go! The genus Nerine in cultivation is most often represented by N. sarniensis and N. bowdenii, but there are in fact 25 species in the genus. Several of them are rare in both the wild and cultivation, but many are extremely attractive and well worth growing if they can be obtained. Space precludes me developing a very large collection of nerines of any sort, but I grow a few of these 'other' species. These are all currently in flower. Nerine humilis (above) comes from the Western Cape, where I've seen it growing (but not flowering) in large colonies in thin soil over rock. Like N. sarniensis (with which it will hybridize) it is winter-growing and summer deciduous, producing its inflorescence in autumn and the narrow, flat leaves shortly thereafter. It seems to be easily grown in a very gritty compost and given a dry (but not baked) summer rest. In the Eastern Cape there is a tendency for species to be evergreen, at least in cultivation. One of these, with very narrow,thread-like leaves is the diminutive N. masoniorum (right), which is now considered to be Critically Endangered in the wild due to degradation of its habitat. Having driven through this area of Eastern Cape last month, and seen the environmental degradation thereabouts it was not difficult to see how this could happen. The epithet masoniorum commemorates both Marianne Harriet Mason (1845-1932) and her brother Canon Edward Mason, who was Principal of St Bede's Native College at Umtata, formerly in the Transkei (now Mthatha, Eastern Cape). According to Gunn & Codd's Botanical Exploration of Southern Africa (1981), Marianne 'made leisurely journeys by cart and horses to out-of-the-way places' [in eastern South Africa] collecting seeds and bulbs and painting plants. Also from the Eastern Cape are two forms of N. undulata, with broader, flatter leaves that are evergreen until frosted off. The first, seen above, is a very fine plant, producing its bright pink flowers very freely. It is hardy outdoors in southern England and soon makes a good clump, though these plants are potted and kept in the greenhouse. The leaves are long and narrow, which quickly distinguishes the plant from the second form. This was (and often still is) known in cultivation as N. flexuosa but that name is technically a synonym of N. humilis. This plant, with comparatively short, broad leaves, and less 'crinkly' flowers in either pink or white, is placed as a variant of N. undulata by Graham Duncan in his book Growing Nerines (2002) but he suggests that this may only be a temporary holding ground while further studies take place. It is also hardy in southern England, but we only grow the white form in pots at Colesbourne. I'll post a picture when its flowers open in a few days time. Today's edition of The Observer includes an article by Desmond Balmer entitled Homing instincts: Britain's top 10 boltholes, reviewing the forthcoming Good Hotels Guide for 2011. First on the list, which picks ut ten characterful places to stay, is Austwick Hall, located in Austwick in the Yorkshire Dales. We had a wonderful few days there in June 2008, enjoying the beautiful house, the superb food and the lovely garden. The house and food get their mead of praise from Mr Balmer, but he doesn't mention the garden, which is a major focus of attention for the owners Michael Pearson and Eric Culley. Having been rather overgrown and rambly, they have brought it under control and given it structure, and have greatly increased the diversity of the plantings. A feature of particular interest to me, though I have not yet seen it in flower, is the development of a snowdrop walk, amongst which are placed a collection of sculptures. 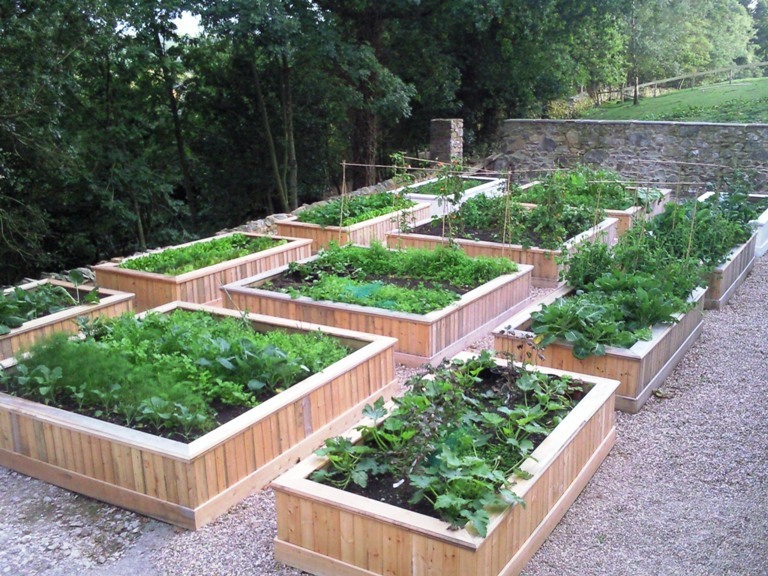 This year's major development has been the creation of a vegetable garden in raised beds, supplying produce for Michael's use in the kitchen (right, pic by Eric Culley). The gardens are open for the National Gardens Scheme, and at other times of the year by appointment, though I believe they are planning snowdrop open days next year. A selection of pictures is available on their website. The genus Nerine has a very special place in the autumn garden, providing seasonal interest and colour both in the greenhouse and outdoors. All come from South Africa, but they are spread between the winter- and summer-rainfall areas, so that although they all look rather similar, they have very different requirements in cultivation. The first to be introduced, sometime in the seventeenth century, was Nerine sarniensis, which is common in the fynbos around Cape Town and would have easily been available for sailors to collect and bring home on Dutch East India Company ships. The story of the bulbs becoming established on Guernsey in the Channel Islands dates to the 1660s or so and, regardless of how it happened, this circumstance is responsible for the specific epithet sarniensis, which means 'of Guernsey'. As a typical winter-growing Cape bulb, N. sarniensis develops its foliage through the winter and spring and becomes dormant as temperatures rise and the soil dries out in early summer. This means that, in areas with cold winters, it must be grown under glass, usually as a potted plant, to avoid the leaves being damaged by the elements. Its flowers, in a huge array of reds, pinks and white, appear as temperatures cool and water becomes available in autumn. As an easily grown plant, needing only a cool greenhouse, it has always been popular and breeding and selection work was started in the nineteenth century. This work was continued here at Colesbourne by H.J. Elwes, and then onwards by a succession of breeders in western Europe, culminating in the work of Sir Peter Smithers in Switzerland, whose bulbs now form the core of the magnificent collection (above, and right) at Exbury in Hampshire owned by Nicholas de Rothschild. The diversity of the plants grown there can be seen on their website, but the printed version of their catalogue is, unfortunately, rather disappointing. Although generally thought of as Nerine sarniensis, other species were used in the breeding programme from an early date, so most of the cultivars are probably not pure representatives of that species. ﻿﻿﻿Breeding was not confined to Europe however, and Nerine sarniensis hybrids are also popular in Japan. Kees Sahin, the remarkable Dutch plantsman and seedsman, for whom I used to work, had an extraordinary tale about them. There was an old breeder who had a superb collection of plants, the result of a life's work. One day at flowering time he cut a bunch of the best stems and sent them to the famous Japanese plant breeder, Dr. Hirao, then destroyed all his plants and committed hara-kiri. What he had not bargained with was that nerines mature their seeds very quickly after flowering, and can do so even on a cut stem; Dr. Hirao was thus able to gather seed from the best clones in Japan and continue the breeder's work. The plant shown above is known as 'Hirao h81h' and is presumably a derivative of this original stock. The western counties of England have a rich fruit-growing heritage: Worcestershire and Herefordshire are noted for their cider production, but Gloucestershire also has a long history of tree fruit cultivation, including plums and perry pears as well as apples. As usual, most of the cultivars traditionally grown were local selections, propagated in limited numbers for planting in the vicinity and as time went by became marginalized by more productive 'standard' cultivars. 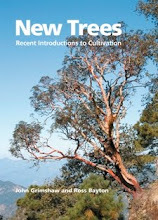 Nevertheless, trees lingered on and sometimes their names have done so too, making it possible to develop collections of named local cultivars. 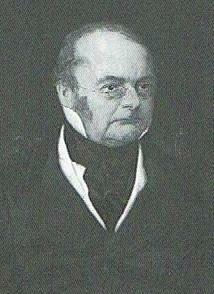 This has been spearheaded by the enthusiasm of Charles Martell, a dairy farmer best known for inventing the cheese called Stinking Bishop, but who has developed collections of Gloucestershire cultivars of plums, perry pears and apples, and most importantly has produced an online guide to the Native Apples of Gloucestershire based on his research. It lists 185 cultivars, of which 104 are grown in the collection. The work of conserving the county's apple heritage is also supported by the Gloucestershire Orchard Group. In the old walled garden at Colesbourne Park are a few ancient apple trees, including three of a cultivar known to the Elwes family as 'Rose of Ciren' which is what it was called by Charlie Neve, the long-standing gardener through the middle of the Twentieth Century. It is a lovely yellowish colour, sometimes with a faint pink flush, with soft white flesh, and is aromatic with a delicious sharp flavour. It's eatable from the tree during September and October, but does not keep long when picked. Many old apples are, frankly, not very interesting to eat, but in my opinion 'Rose of Ciren' is excellent. 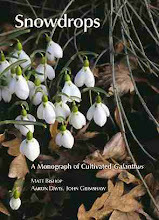 Charles Martell came to colect propagation material a few years ago and has written it up in his text, where he says that it is critically rare and known only from the Colesbourne originals. It was said by Charlie Neve to have originated from the Royal Nursery owned by John Jefferies and Sons at Siddington, just south of Cirencester, but it would seem that it never achieved wide circulation. I plan to get some grafted this winter. This afternoon - a glorious day followed the frost - we went out to an apple day at Oxenhall near Newent in western Gloucestershire, where there were various apple-related activities at the village hall. The Gloucestershire Orchard Group had a display of local cultivars picked from Charles Martell's orchards, making a glowing display (right) and we were able to look round the orchards of Hilter Fruit Farm, where 'Cox's Orange Pippin' and 'Golden Delicious' (living up to its name in both regards) were dripping from the trees. We came away with several large bags of apples and pears, including some of the most famous of Gloucestershire apples, 'Ashmead's Kernel', a fine crisp and flavoursome cultivar that rivals a "Cox" when at its peak. Our own young tree is doing what it can (see below) but we get through a LOT of apples. The history of this cultivar is interesting and is discussed on the GOG site: it is curious that, although well-regarded locally for a couple of centuries at least, it is only recently that its merits have been more widely appreciated. The summer show came to an abrupt end last night as a sharp frost developed. It was not unexpected, so the tender plants were all under cover, and the house is full of flowers picked in the gloaming to give us a few more days of pleasure, but the first frost of the season is always a horticultural turning point. At least we have had a longer frost-free period than in some years, from 12 May to 17 October. The large late herbaceous plants are continuing to provide a lot of colour in the garden. Among those that are not composites are several selections of Aconitum carmichaelii, in its broad sense, of which two are particularly fine. 'Royal Flush' (above) is named for its young foliage, which emerges rich red in about March, and is quite striking for a week or two then before it turns to dark green.This shade is maintained through the season and thus complements the dark purplish blue flowers now: pallid and tatty foliage at flowering time mars several monkshoods, but not this one. The flowers are held in short, rather dense spikes on stout stems that are no more than about a metre in height, making it particularly robust and not prone to collapse. The second is ‘Spätlese’ (right and below), whose name betokens its lateness, a taller clone with excellent vigour. Its only flaw is a tendency to pallid foliage, but amongst other plants this is not too noticeable and the pale blue flowers go well with most other pastel shades. It was planted next to Lythrum salicaria 'Blush' to attempt a pink-blue combination, but the Lythrum has usually finished by the time the Aconitum starts, so it actually partners the next clump along, Ligularia sp. HC970257 which is still producing masses of soft yellow flowers (visible to the left in the image below: the orange flowers are from Helenium 'Sahin's Early Flowerer'). This afternoon I visited Brampton Bryan Park, in west Herefordshire, almost adjacent to the Welsh border, in company with a number of members of the International Dendrology Society attending meetings and events in that area. This is an extremely beautiful area of classic English parkland, grazing land with scattered trees, set in a natural shallow bowl of the hills. Bounded by six miles of fence, this is a statutorily protected Site of Special Scientific Interest on account of its ancient trees, grassland and adjacent woodland and the biodiversity they support: Ravens, Red Kites and Buzzards were conspicuous overhead while we were there. Despite its great value to the naturalist, the site is perhaps of even more interest to the historian. The Brampton Bryan estate has never been bought or sold: as unoccupied land it was granted by William the Conqueror to Ralph de Mortimer and at the time of the Domesday survey in 1085 it was tenanted by one Richard, known as the Nameless. His descendants held it until 1309, when it passed by marriage into the Harley family, who last year celebrated their seven hundredth anniversary of ownership. The family developed the castle and established the deer park, whose current boundaries are believed to reflect its original layout, probably during the 13-1400s, though it is not mapped as parkland until 1577. Deer and cattle would have been kept within its boundaries, fenced in by chestnut paling on a bank. Within the park ancient Sweet Chestnut trees planted in lines would suggest that there were internal divisions: today they are magnificent ancient giants. Old oaks are abundant, though hard to date: on the hillside and now surounded by a Redwood (Sequoia sempervirens plantation) is a magnificent veteran pollard oak (right). In the 1640s Brampton Bryan was in the hands of Sir Robert Harley (1579-1656), a Member of Parliament, and supporter of the puritan movement: it was at his instigation that the original Charing Cross was pulled down. as an 'idolatrous monument'. As the country descended into civil war he was away from home, and as the Royalist forces advanced on this Parliamentarian seat it was left to his wife Brilliana to defend the castle against a siege. 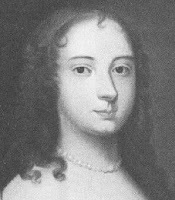 It is fortunate that her letters to her absentee husband have survived as they give a vivid picture of her life both before and after the first siege, which lasted from 26 July to 9 September 1643, when the Royalist forces moved off to concentrate for what would become the first Battle of Newbury. The effort of defending the castle wore her out, however, and she died of a cold in October 1643. The castle was again besieged in 1644 and taken and sacked in April that year. It remains ruined, adjacent to the house the Harleys built following the Restoration. The current state of the park is due to the current Edward Harley and his wife Victoria (who showed us around), who inherited it in an overgrown state and has worked hard to restore it to its current beauty with careful management (although one feels that care must be taken not to make it too tidy). Large numbers of new trees have been planted, mostly oaks raised from homegrown seed and it was interesting to see several trees with a wide sheet of fleece spread below them, catching the current year's bumper crop of acorns. Collecting the acorn crop from a Sessile Oak, Quercus petraea. The news coverage of the continuing rescue of the miners trapped in the San Jose mine near Copiapo in Chile reminds me that this area of the Atacama desert is home to the cactus genus Copiapoa. There are about 21 species, and numerous subspecific taxa of these clump-forming, barrel-shaped cacti, ranging in size from tiny to up to a metre or so, well-protected by masses of spines and often a dense wax layer to avoid desiccation. The yellow flowers are small and appear at the centre of the plant body (info from The New Cactus Lexicon, 2006, image by Stan Sheps, from Wikipedia). Opinions are divided on the late-flowering species of Salvia: some think they're wonderful and can't have too many, while others regard them as a waste of space, flowering too late to be of real value and requiring too much in the way of overwintering care to make them worthwhile. This is a coin that can be viewed from both sides: last year an early frost robbed us of their display, but the mild weather we are currently enjoying is allowing them to make a really useful contribution to the garden. As usual, I think it is down to being selective, and choosing to grow species and cultivars that can be relied upon to perform in one's own conditions, always trying new things along the way. Two that I have grown this year for the first time are the well-known 'Indigo Spires' (top) and a clone smuggled back from South Africa by a friend. This has shot up to head-height, and in the cottage garden is currently thinking about expanding small inflorescences of purple bracts and flowers: against a wall at Colesbourne Park there are actually two or three flowers open (right). It may be lovely in South Africa, or in a conservatory, but I'm afraid my plants are being left out for hardiness testing: here it is not worth the space or trouble to keep it growing through the winter. 'Indigo Spires', on the other hand, is superb, and I can't imagine how I managed without it in the past. It has looked good most of the summer, and is now combining well with Helianthus 'Lemon Queen': earlier in the season Scabiosa columbaria subsp. ochroleuca entwined through it made a very pretty sight. Salvia is one of a handful of genera to have flowers in all three primary colours, enabling different species to appear in many different garden combinations. The red and orange flowered species are particularly valuable at this time of year, when they glow in the low-angled sunshine. A relatively recent introduction is Salvia haenkei 'Prawn Chorus', apparently a compact selection of a large and sprawling Bolivian species. Whoever gave its name was inspired, as the flowers do suggest miniature prawns standing on their tails: in the wild they would be pollinated by hummingbirds. So, presumably, are the stubby flowers of S. confertiflora (left, with Kniphofia 'CoolKnip'), appearing from russet-velvet calyces on long inflorescences. This is one of the plants that I sometimes think isn't worth the trouble to grow, as it gets larger and leafier through the summer before the flowers appear, but I always repent and ensure there are cuttings in for the winter. Now, when it is flowering well, there are no such thoughts to entertain. Also with furry calyces, but even more chenille-like, is Salvia leucantha (above). This Mexican species is a low-growing shrub, producing narrow, white-backed leaves, and, late in the season, the arching inflorescences of purple-furred buds. Where it is perennial these appear over a long season, but here they need the weather to be kind to achieve full potential, usually managing about a couple of weeks before being ruined by frost. The corolla is usually white, but is sometimes purple, as in the clone grown here, probably that known as 'Midnight'. Although the species mentioned above are all tender, there are some excellent hardy species of Latin American salvias (in addition to the more generally hardy shrubby species and cultivars allied to S. microphylla). Among these are the familiar blue S. uliginosa and S. guaranitica, but also the tall, robust S. atrocyanea. This is a totally hardy plant here and looks well at the back of the border, where the many stout flowering branches are covered in blue flowers emerging from green bracts. It also starts in August, so has a good long flowering season. All these salvias are easily propagated from cuttings, though it is always rather annoying that you have to take the tips of shoots that should bear flowers a few weeks down the line. I like to get them taken while it is still warm in August, as they then root very quickly and well, potting them up (into 7 cm pots, to save space) as early as possible in September so that their roots are established in the pot before warm weather fades. If this isn't possible I prefer to leave a crowded pot of cuttings to overwinter without disturbance. This is preferable to having a young plant loose in a pot of damp compost all winter, I feel: they soon burgeon into growth in spring. Although it is perhaps a little late I have potted up this year's crop of cuttings today (right), counting on the continued mild forecast to get them settled and growing well before the weather turns. Salvia fulgens 'snake': the stigma protrudes from the upper lip.